Toygers are bred to look like tigers, so ideal members of this breed have a short, reddish-orange coat with black tiger stripes. Because the breed is still in development, not all Toygers have ideal tiger striping. Breeders also strive for small, round, wide-set ears and a strong, deep and wide chin. 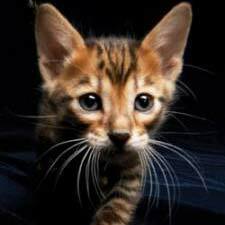 Pet kittens being sold right now are those that will not be used to help develop the breed because they do not possess ideal Toyger characteristics. Toygers are bred to be trainable and easygoing cats. They love children and other pets, and are highly intelligent. Toygers are best kept indoors because their unique coats make them attractive to thieves. They are also good hunters, and with their camouflage coats, can do damage to local wildlife. Toygers are a rare breed still in development. Kittens of this breed can be hard to come by. The development of the Toyger began in the 1980s with a California Bengal breeder named Judy Sugden. Sugden discovered face markings on two of her Bengal kittens that were similar to circular markings seen on tigers. This inspired her to breed for a domestic cat with a tiger-like appearance, using Bengals and Domestic Shorthaired tabbies. In 1993, the International Cat Association (TICA) accepted the Toyger for Registration Only. In 2000, the Toyger was accepted as an Evaluation New Breed. In 2006, the status was changed to Advanced New Breed. Toygers can now be evaluated by judges at TICA cat shows, but are not eligible for Championship judging.